Our 30 foot tall 3 lane fiberglass carnival slide is just like the big slide you see at the fair but designed for short term rentals at an affordable price. This slide has 3 lanes for super high output to keep the lines moving during your event. The number one complaint at any carnival or fundraising event is the lines are too long and this slide will help solve that problem. 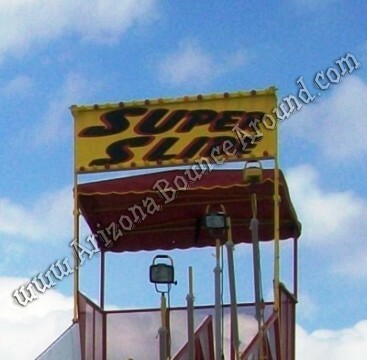 Our big carnival slide comes complete with flashing LED carnival lights, 2 attendants, generator, lights, carnival slide safety signs, aluminum fencling with gates and plenty of burlap sack slide blankets. All we need from you is the space and the sliders. Our giant carnival slide can be themed with corporate branding, holiday themes or whatever you can think of to make your event look amazing. 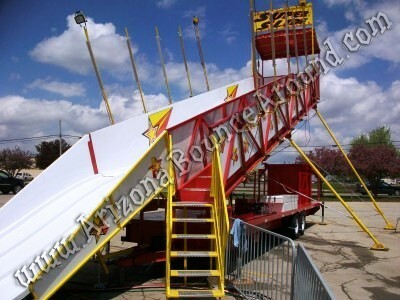 We stock lots of carnival rides and slides for year round entertainment in Colorado. Giant water slides during the summer, giant dry slides for spring and fall festivals. 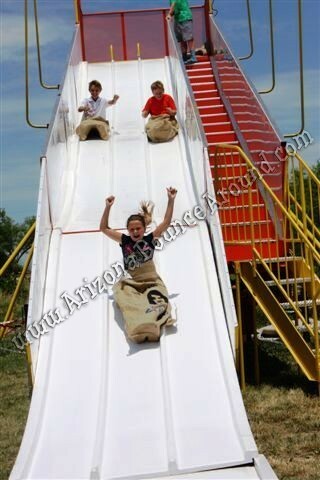 This carnival slide will be a big hit at graduation parties and is perfect for almost all ages. Everyone loves to slide fast so rent this slide for your next carnival themed event.